Winter Holly truly looks like beautiful winter greenery, with just a bit of shimmering sparkle that's predominantly gold but also gives the occasional, holographic flash in the light. The effect is understated yet lush, festive without clamouring for attention. I wish I'd been able to capture more of the sparkle because it really is gorgeous, all the more so for the light touch China Glaze used with it to let the beautiful green remain the star of the show. I used three coats for these pictures, but even with its thin first coat you could probably get away with two if you're generous and even with the second. I recommend sticking with a thin second coat, though, because while the formula is great and easy to control, it can start pooling towards the edges if you have too much on your brush. It's also very top coat hungry; I ended up using three whole coats of SV before the surface was totally smooth. But the texture is one of the things I love about Winter Holly, so if you don't want to smooth it all out and gloss it up, it actually looks great as a matte glitter, all by itself! That photo's worth clicking just to see how lushly green the formula really is. This polish very specifically reminds me of the candles at Grandmama's house with the holly-and-berry decorations. So yes, Winter Holly. Does just what it says on the tin, beautifully. I love green and I love glitter! Christmas makes me happy and so does this polish!! Yay Christmas polishes!! I love how happy and glittery they are :) This one is gorgeous, it's like the perfect Christmas tree (or winter holly, haha) green! This is STUNNING but I'm so disappointed by the grittiness. So so pretty! Shame it's so great would of thought seche would have done the job! Thanks, Jazz! Yeah, it's definitely a top coat eater. I'm so in love with this color! It is perfect for the holiday season. It really is such a great green for the holidays--thanks, Melissa! Thanks, Elizabeth! I really do like the unique texture, and I LOVE that you still get the glints and gleams of the holo particles, even while it's still matte. 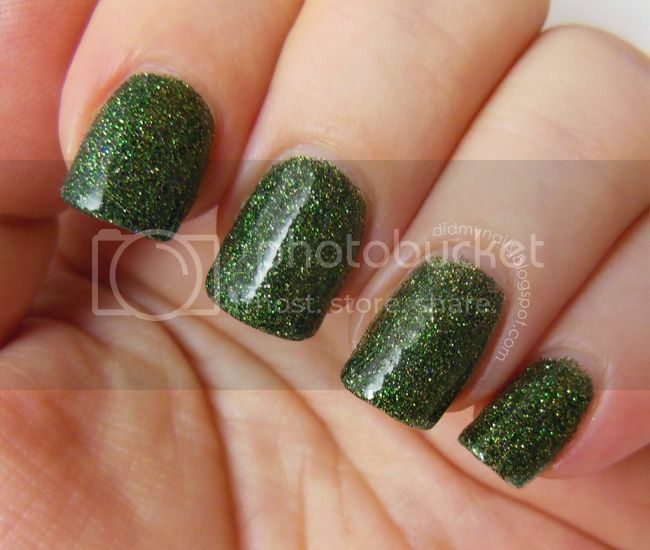 Great glitter, really looks like tree, especially matte. And that finish by itself kind of seems close to new OPIs liquid sand finish from Mariah collection. Definitely could be worn without tc. I am definitely keeping my eye out for this! Its uniqueness is one of the reasons I grabbed this one. I definitely didn't have anything else like it! Really gorgeous pics of a gorgeous polish! Thank you so much, Chelsea! I was excited to try it myself--the gold and silver were the ones I wanted the most, but I was really intrigued by this green. CG Winter Holly.. TO THE WISHLIST YOU GO! Thanks, Brandi! I really hope you enjoy it!! Lovely! I wasn't going to order this one, but I think you've changed my mind! Is this is so pretty on you! I am patiently waiting for mine to come in the mail. Oh can I have your nails please, they are like perfect! Haha! Just got this one and can't wait to wear it!